Visitors to Fairfield Woods Branch Library on a recent Saturday were bobbing and weaving as they learned the particulars of the ancient craft of handweaving. Led by members of the Handweavers Guild of Connecticut, the workshop attracted about two dozen women who learned some history, saw demonstrations of different methods of weaving, and got hands-on experience making small hand-woven items. "This is part of a monthly craft salon series we offer," said reference librarian Ellen Harvey. "We have been inviting regular craft people, including craft authors and bloggers, to share their talents with us in a hands-on setting with adults. We're always looking for different ideas and handweaving is a great winter distraction." The Handweavers Guild agreed to be make the February presentation, and four of its members led the workshop, bringing a variety of looms and samples to show. Harvey said the workshop aligns well with "the library's mission to be a community commons for the exchange of ideas and education." Nan Jackson, the guild's area chairwoman, said the group has grown to 220 members since its founding more than a half-century ago. 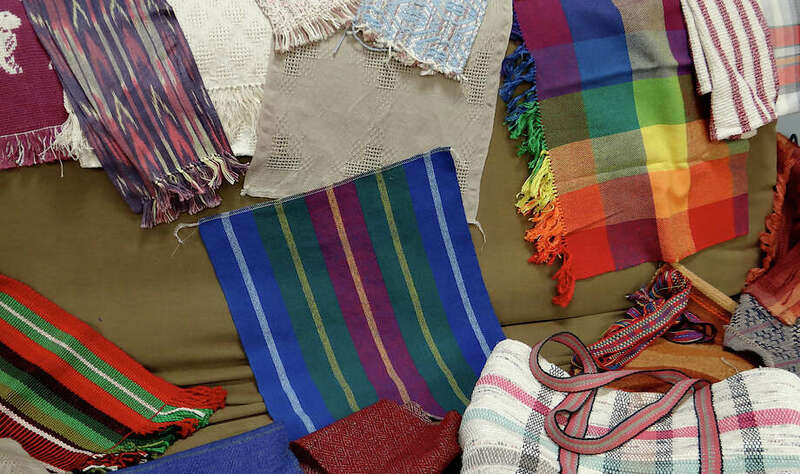 "Many of our members are professional weavers, but it's basically a hobbyist guild," she said. "About five times a year, we all meet in Glastonbury for small workshops in the morning and a program in the afternoon." Jackson said that weaving has a rich historical tradition. "One type of handweaving, called Sprang, has been found in tombs in the Gobi Desert," she said. "Egyptian mummies were wrapped in fabrics. Unfortunately, most weaving mills have gone the way of the dinosaur. We guild members enjoy doing this as it's always a learning process. Some of us are historians and preservationists, carrying the craft forward." Guild member Rebecca Arkenberg learned to weave in college in 1969. "It was part of an art education degree," she said. "I really took to weaving. I love the feel of yarn. There are many possibilities with the creations." Julia Ortner, also a member, told the group, "On my honeymoon, I saw Navajo handweaving in Taos, New Mexico, and fell in love with it. When I joined the Handweavers Guild, I took a workshop on card weaving and one of the first things I made was a guitar strap for my husband, who's a guitarist. You can weave anything -- curtains, hand towels, tote bags, napkins, pillow covers and table runners." Another member, Deb Greenberger, said, "I started sewing when I was 12, and knitted much of my life. Now I have a floor loom at home." Marcella Agerholm of Fairfield found the weaving program to be fascinating. "I love what the library offers," she said. "It's like camp for adults. I love mixing colors and being creative, so the handweaving really appealed to me."